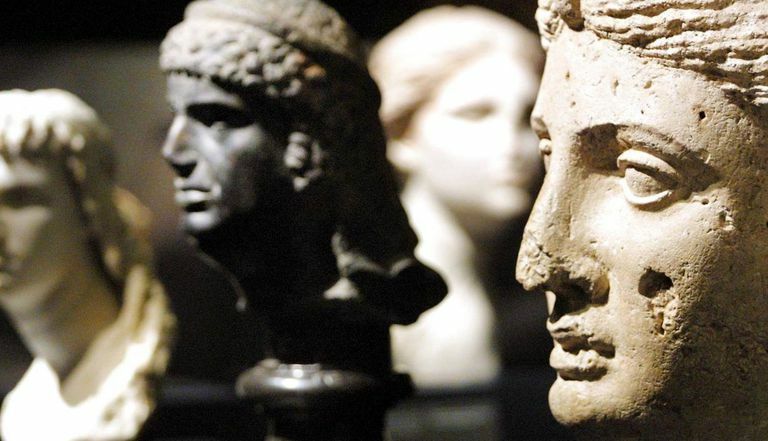 What Do We Know About Cleopatra's Ancestry? Race: What Is It and What Was It in Antiquity? That Cleopatra was an African queen is certain—Egypt is, after all, in Africa—but was Cleopatra black? Cleopatra VII is usually just known as Cleopatra, though she was the seventh royal Egyptian ruler to bear the name Cleopatra. She was the last of the Ptolemy dynasty to rule Egypt. She, like many other Ptolemy rulers, first married one brother and then, on his death, another. When her third husband, Julius Caesar, took Cleopatra back to Rome with him, she certainly caused a sensation. But did the color of her skin have anything to do with the controversy? There's no record of any reaction to the color of her skin. In what's called the "argument from silence," many conclude from that silence that she did not have dark-colored skin. But an "argument from silence" only indicates possibility, not certainty, especially because we have little record of the motivation for those reactions. Shakespeare uses the word "tawny" about Cleopatra—but Shakespeare wasn't exactly an eyewitness, missing meeting Egypt's last Pharaoh by more than a millennium. In some Renaissance art, Cleopatra is portrayed as dark-skinned, a "negress" in the terminology of that time. But those artists were also not eyewitnesses, and their artistic interpretation may have been based on trying to depict Cleopatra's "otherness," or their own assumptions or conclusions about Africa and Egypt. In modern depictions, Cleopatra has been played by white actresses including Vivien Leigh, Claudette Colbert, and Elizabeth Taylor. But the writers of those movies were, of course, also not eyewitnesses, nor are these casting decisions in any sense credible evidence. However, seeing these actresses in these roles may subtly influence what assumptions people have about what Cleopatra really looked like. Europeans and Americans became quite focused on the racial classification of Egyptians in the 19th century. While scientists and most scholars have by now concluded that race is not the static biological category that 19th century thinkers assumed, many of the theories around whether the Egyptians were a "black race" assume race is a biological category, not a social construction. It is during the 19th century that attempts to classify the Egyptians into what were assumed to be the key races were common. Whether other people of nearby lands—Jews and Arabs, for example—were "white" or "Caucasians" rather than "Negroid" was also part of this argument. Some argued for a separate "brown race" or "Mediterranean race." Some scholars (notably Cheikh Anta Diop, a Pan-Africanist from Senegal) have argued for a sub-Saharan black African heritage of the Egyptians. Their conclusions are based on such arguments as the Biblical name Ham and the naming of Egypt as "kmt" or "the black land." Other scholars point out that the association of the Biblical figure of Ham with dark-skinned sub-Saharan Africans, or a black race, is relatively recent in history, and that "the black land" name for Egypt has long been held to be about the black soil that is part of the phenomenon of Nile flooding. The most commonly accepted theory, outside the Black Egyptian theory of Diop and others, is what's known as the Dynastic Race Theory, developed out of research in the 20th century. In this theory, the indigenous people of Egypt, Badarian people, were invaded and overrun by Mesopotamian people, early in Egypt's history. The Mesopotamian people became the rulers of the state, for most of the dynasties of Egypt. If Cleopatra was Egyptian in heritage, if she was descended from native Egyptians, then the heritage of Egyptians in general is relevant to the question of whether Cleopatra was black. If Cleopatra's heritage was not Egyptian, then the arguments about whether Egyptians were black are irrelevant to her own blackness. The Ptolemy dynasty, of which Cleopatra was the last ruler, was descended from a Greek Macedonian named Ptolemy Soter. That first Ptolemy was established as ruler of Egypt by Alexander the Great's conquest of Egypt in 305 B.C.E. In other words, the Ptolemies were imperialist outsiders, Greeks, who ruled over native Egyptians. Many of the Ptolemy ruling family marriages were incestuous, with brothers marrying sisters, but not all the children born in the Ptolemy line and who are ancestors of Cleopatra VII are known to have had both father and mother who were Ptolemies. Here is the key evidence in this argument: We are not certain of the heritage of Cleopatra's mother or her paternal grandmother. We just don't know for sure who those women were. Historical records are not conclusive of what their ancestry is or what land they come from. That leaves 50% to 75% of Cleopatra's ancestry and genetic heritage unknown—and ripe for speculation. Is there any evidence that either her mother or paternal grandmother was a black African? No. Is there any evidence that either of those women were not black Africans? No, again. There are theories and speculation, based on sparse evidence, but no certainty where either of these women came from or what might be, in nineteenth century terms, their racial heritage. The father of Cleopatra VII was Ptolemy XII Auletes, son of Ptolemy IX. Through his male line, Cleopatra VII was of Macedonian Greek descent. But we know that heritage is also from mothers. Who was his mother and who was the mother of his daughter Cleopatra VII, the last Pharaoh of Egypt? In another standard genealogy, Ptolemy XII's mother is a Greek concubine and Cleopatra V's mother is Cleopatra IV, not Cleopatra Selene I. Cleopatra VI's parents are Ptolemy VI and Cleopatra II rather than Ptolemy VIII and Cleopatra III. The ancestry, in other words, is open to interpretation based on how one views the available evidence. Some scholars conclude that Cleopatra's paternal grandmother, mother of Ptolemy XII, was not Cleopatra IV, but was a concubine. That woman's background has been assumed to be either Alexandrian or Nubian. She may have been ethnically Egyptian, or she may have had a heritage which we'd today call "black." Cleopatra VII's mother is usually identified as her father's sister, Cleopatra V, a royal wife. Mention of Cleopatra Tryphaena, or Cleopatra V, disappear from the record around the time that Cleopatra VII was born. Cleopatra V, while often identified as a younger daughter of Ptolemy VIII and Cleopatra III, may not have been the daughter of a royal wife. If this scenario is accurate, Cleopatra VII's maternal grandmother may be another Ptolemy relative or someone unknown, perhaps of a concubine of Egyptian or Semitic African or black African background. Cleopatra V, if she died before Cleopatra VII was born, would not be her mother. In that case, Cleopatra VII's mother would likely have been either a Ptolemy relative, or, again, someone unknown, who might have been of Egyptian, Semitic African, or black African heritage. The record is simply not conclusive as to the ancestry of either Cleopatra VII's mother or maternal grandmother. The women may have been Ptolemies, or they may have been of either black African or Semitic African heritage. Complicating such discussions is the fact that race itself is a complex issue, with unclear definitions. Race is a social construct, rather than a biological reality. In the classical world, difference was more about one's national heritage and homeland, rather than something we'd today call race. There's certainly evidence that Egyptians defined as "other" and "less" those who were not Egyptians. Did skin color play a part in identifying "other" at the time, or did Egyptians believe in the heritability of an "otherness" of skin color? There's little evidence that skin color was more than a marker of difference, that skin color was conceived of in the way that 18th and 19th century Europeans came to conceive of race. We do have early evidence that Cleopatra was the first ruler in her family to actually speak the native Egyptian language, rather than the Greek of the Ptolemies. Such could be evidence for an Egyptian ancestry, and could possibly but not necessarily include black African ancestry. The language she spoke doesn't add or subtract any real weight from an argument about black African ancestry. She might have learned the language for political reasons or just from exposure to servants and an ability to pick up language. Perhaps the strongest evidence cited against Cleopatra having black ancestry is that the Ptolemy family was quite xenophobic—against "outsiders" including the native Egyptians they ruled for about 300 years. This was more as a continuation of Egyptian custom among rulers than it was racial prejudice—if daughters married within the family, then loyalty was not divided. But it's not likely that those 300 years passed with only "pure" heritage—and, in fact, we can be skeptical that either Cleopatra's mother and father had mothers who were of "pure" Macedonian Greek ancestry. Xenophobia could also account for active cover-up or simply omitting mention of any other ancestry than Macedonian Greek. Unfortunately, the modern proponents of the "Black Cleopatra" theory—starting with J. A. Rogers in World's Great Men of Color in the 1940s—have made other obvious errors in defending the thesis (Rogers is confused about who Cleopatra's father was, for instance). They make other claims (like that Cleopatra's brother, whom Rogers thinks is her father, had obvious black features) without evidence. Such errors and unsubstantiated claims don't add strength to their argument. A BBC documentary, Cleopatra: Portrait of a Killer, looks at a skull which might be from a sister of Cleopatra—or rather, the documentary looks at the reconstruction of a skull, since no actual skull was found in the tomb—to show features which have similarities to both Semitic and Bantu skulls. Their conclusion was that Cleopatra could have had black African ancestry—but that is not conclusive evidence that she did have such ancestry. Was Cleopatra black? It's a complicated question, with no sure answer. It is likely that Cleopatra had ancestry other than pure Macedonian Greek. Was it black African? We don't know. Can we say for sure it was not? No. Was her skin color very dark? Probably not.